The Silent Scream is a 28-minute documentary film produced in 1984 by American Portrait Films, located in Anaheim, California. The film presented the abortion of a 13-week fetus, as visualized on an ultrasound screen. The film was scripted and directed by Executive Producer Donald S. Smith. the owner of the firm. Working closely with Smith was Jack Duane Dabner, a free-lance film producer. The main character in the film was ex-abortionist Dr, Bernard N. Nathanson, a board-certified obstetrician and gynecologist. He also owned and provided the ultrasound videotape featured in the film. In his presentation, Nathanson covered human gestation generally, then gave a step-by-step description of the suction aspiration abortion being shown on the ultrasound screen. 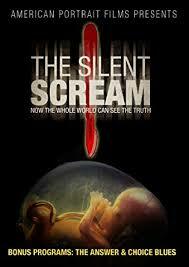 Production of the Silent Scream came about because of another documentary pro-life film Smith was producing in 1984. Titled Conceived in Liberty, Smith wanted to include in the film the ultrasound videotape that Nathanson had acquired from an abortionist friend. Smith hurried to New York City, and met with Nathanson at his Lexington Avenue office. There Nathanson narrated the abortion tape, which Smith added to Conceived in Liberty. Thus Conceived in Liberty basically had the content of The Silent Scream in it, although that name was not used. Conceived in Liberty was premiered at the annual convention of the National Right to Life Committee in September, 1984. Nathanson was present at this meeting, and personally presented his ultrasound videotape. In October,1984 Nathanson, from his office in New York city, called Smith in Los Angeles. Nathanson stated that he was getting so much response to his episode in Conceived in Liberty that a film dealing just with this episode was indicated, Smith quickly sketched out a screenplay, and sought funds for the production of a 28-minute full-color film. Early in November Nathanson went to Whittier, California, where on the sound-stage of Moody Institute of Science the new film was shot. At this point the title “The Silent Scream” was assigned to the film. After three days of shooting the film was “in the can.” Nathanson returned to New York, and editing of the film began in Whittier, California. Before the end of the year The Silent Scream film was completed. Both high-quality videotapes and 16-mm prints were produced. The Silent Scream was immediately popular in the pro-life movement, and it came to the attention of President Ronald Reagan. In the 1985 March for Life in Washington, DC on the anniversary of the U.S. Supreme Court’s Roe v. Wade decision, President Reagan spoke to the crowd through loud speakers. He referred to The Silent Scream film, and said that he hoped and prayed that it would be watched by every federal legislator. Several days later a White House public relations manager, Bob Reilly, contacted Smith by phone. He wanted Smith to assist him in putting on a press conference releasing The Silent Scream to the American public. Together they settled on February 12, Lincoln’s Birthday, as the date for the conference. American Portrait Films provided the master film copy, to be projected. The press conference was held in the Executive Office Building, which was considered a part of the White House. The press room was set up for showing The Silent Scream film. About 50 press people were present, including network TV with their cameras, radio reps with their recorders, and reporters from numerous newspapers and magazines. The conference was introduced by a White House public affairs representative, the lights were lowered, and the film was projected. Smith and Nathanson were seated together on the stage, and a period for questioning commenced, Nathanson was addressed by the reporters, who wanted to know his professional motives and financial involvement in the film. Before the close of the conference, Smith gave to President Reagan, through a representative, a copy of The Silent Scream wound on a gold-plated reel. He also gave to the congress 550 VHS video cassettes of the film, one for each senator, representative, and U.S. Supreme Court justices. That evening on network television, clips from The Silent Scream were shown throughout the country, Newspapers like the Los Angeles Times also carried the complete story. This, in turn, resulted in conflict between the pro-life movement and the pro-abortion constituency. The pro-life community felt that for the first time the truth was being shown. The opposition made claims of animation, deceit, and medical incompetency, To deal with this controversy, Smith published a book in 1985 titled The Silent Scream. It included the complete text of the film, and the position of 14 medical doctors and scientists attesting to the accuracy of The Silent Scream film. This book also had a copy of a letter from President Reagan to Smith expressing his thanks for making The Silent Scream film. The Silent Scream film became so well known in pro-life circles that Nathanson was invited to visit and speak in several countries. The first place he planned to go was South America. where he would be speaking to either a Spanish or a Portuguese audience. After that he wanted to go to Europe. To assist him with these professional visits, American Portrait films produced lip-sync translations of The Silent Scream in Spanish, Portuguese, Italian, French, German, Japanese, and Korean. In addition, a translation kit was created which allowed countries to make their own translations. By virtue of these translations, The Silent Scream became the most viewed piece of pro-life information in the world.